American race team Erion has an enviable record which has helped them craft a fine range of race products. Put their best together and you get this showcase bike, the Erion Blade. Created by UK importer Performance House, much of the work done on the bike is inside the engine.
" Chassis-wise, the Honda is almost perfect, virtually faultless, " explains Performance House boss Rick Capella. So, short of powder coating the frame, swingarm, sub-frame and pillion pegs race-bike black, the chassis is virtually standard… bar some expert set-up time. The engine has seen the most work. The 929cc motor has been bored out to 955cc. The original Honda bores are plated with a Nikasil coating which helps reduce friction. Nikasil is also very hard wearing… so hard wearing in fact that three tools were worn out as engineers tried to raise the capacity. Erion lightweight race pistons have been used to fit in the new bores and a stage one racing camshaft replaces the Honda one and provides extra lift to the valves, altering the duration of the lift, too. There’s a full stainless steel Erion racing exhaust, the head has been ported and gas-flowed and the electronic ignition re-mapped to suit the new tune. The result is 20bhp more than stock, around 150bhp at the rear wheel and a far faster pick-up. 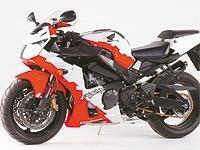 Performance House can carry out a similar tune on your Blade for around £2500 (including the race exhaust). If you fancy going even madder, a 180bhp tune is yours for around £7000. Performance House can be contacted on 01737-780880.